The World Health Organization recently released its report on alcohol consumption around the globe and the statistics show that 1) America is all about beer; 2) beer is gaining in popularity; and 3) beer is delicious. Well that last one is all mine, but it’s easy to infer from the first two points. 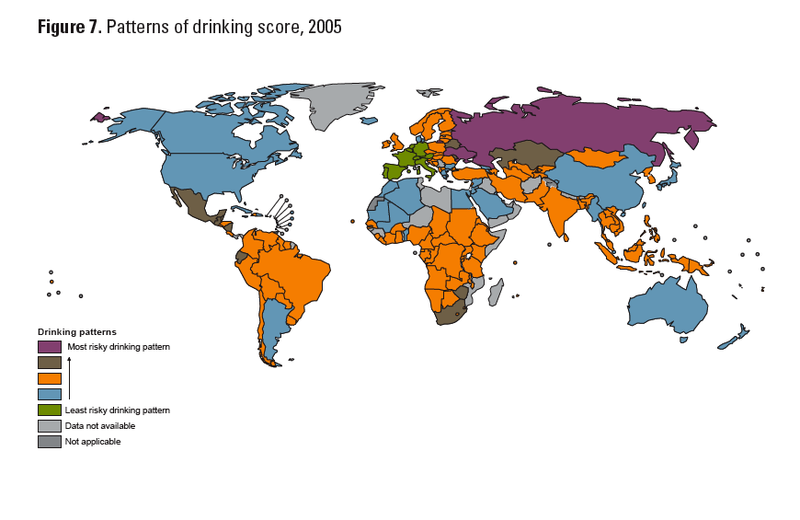 First let’s take a look at how American drinkers stack up to those around the globe. All told, we’re keeping things under control, especially compared to those wild Russians. According to the map below, the average American drinks between 7.5 and 10 liters of alcohol a year. Of course if you’re reading this, you’re probably offsetting several Mormons and possibly an entire Amish village, but the average looks good on paper. The map also shows that if you’re invited to a party in North Africa, don’t bother. If you’re invited to a party in Russia, bring a knife. And what are we Americans drinking? Beer of course! 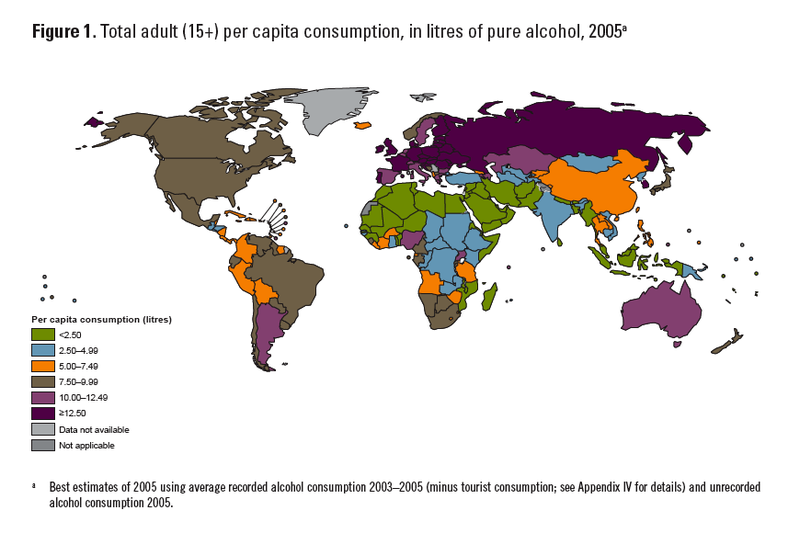 Beer (seen in purple below) is the most popular beverage in many parts of the world, and rules the roost in North America. Taking a quick look at the map, you can see that all those stereotypes are true – Americans and Canadians drink beer, Russians drink spirits (vodka, of course) and the French and Italians are all about the vino. I don’t know what they’re drinking in Africa, but “other” makes my imagination race to scary places. Can you ferment bat’s blood? 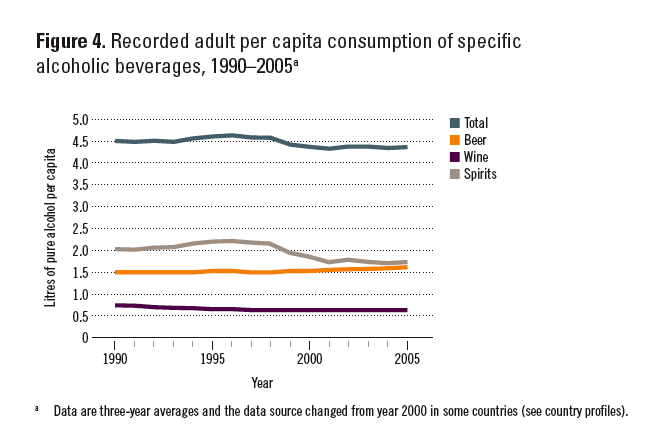 I’m also excited to report that while all other forms of alcohol consumption are declining (along with drinking as a whole around the global), beer has gained in popularity over the past 15 years. More folks still prefer spirits (they start young in Russia! ), but beer has almost caught up. Hopefully a lot of that is the tasty craft variety. For all of those neo-prohibitionists out there who think our country is going to hell, I say relax. 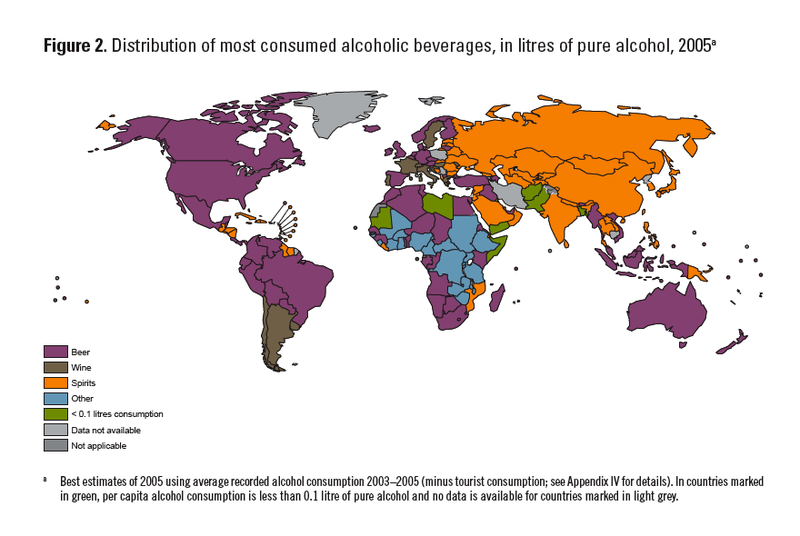 According to the map below, us Americans mostly know how to hold our liquor, as we enjoy one of the least risky patterns of behavior when it comes to alcohol consumption across the globe. I mean we’re no France or Italy, but that goes to show that wine just isn’t worth drinking in excess! Kidding, it shows that societies which allow their members to try alcohol at an early age produce a more enlightened drinker than restrictive ones. I have no idea what’s happening in Russia, but the mornings must be rough. That’s all the stuff that jumped out at me. If you’d like to read all 85 pages, click here for a PDF. All in al, very interesting stuff! In communist Russia, Vodka drinks you. By the looks of it, you’re 100% correct, Briz! When they say 7.5 to 10 liters of alcohol a year, do they mean the actual alcohol content? Or do they mean alcoholic liquid? So… does my 12 ounce bottle of Schlafly Pale count as 12 ounces of alcohol or does it count as 0.53 ounces (12 x the 4.4% ABV)? Is it okay that I don’t answer, except to say that my head now hurts? This is what happens when it’s not baseball season. I use numbers and percentages for evil instead of good. I’m just thinking… if the average American has 10 liters of alcohol, and it includes the full 12 ounces of the beer (for instance), that’s 338 ounces a year. The average American drinks 28 beers over the course of a year. Does that sound right? That’s what I get from the data as well, John. The alcohol listed is pure alcohol so they can compare beer, wine and spirits with a level measurement. I remember reading something several years ago about vodka consumption in a small town in Siberia. This article indicated that the per capita consumption there was two liters PER DAY.